Care Responsibilities: As an IRIS consultant, I assist people in selecting and finding services to meet their outcomes. I am part of a team that helps clients strive towards their goals and be as independent as possible. My primary experience is working with individuals with developmental and physical disabilities as well as those with severe and persistent mental illness and traumatic brain injury. I also have a vast amount of experience in transitions, whether it be from high school, moving out of your family’s home for the first time, or experiencing any other life changing event. 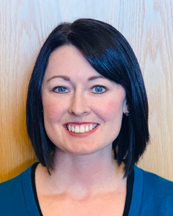 I have worked in a variety of settings including vocational, residential, and recreational which has given me great background knowledge for case management and as an IRIS Consultant. I enjoy working collaboratively to create the best plan to fit the needs of the individual. I enjoy helping individuals create goals while promoting their independence. In my spare time, I enjoy being active; running, hiking, and being outdoors. I am always interested in exploring a new place or trying a new restaurant.